Illinois Governor Rod Blagojevich finally responded to critics over the controversy ripping apart the state's anti-discrimination and hate crimes panel, mainly by saying little or nothing at all about just what he intends to do towards restoring unity to the commission. "What's happened at this commission raises a much bigger challenge that all of us have, and that is to try to bring communities and people together," he said in Bolingbrook after an event touting his $3.2 billion road and school construction proposal. "I am personally going to be involved, and I am personally going to make sure we do everything we can to bring people together." "I condemn what Minister Farrakhan said . . . They were anti-Semitic remarks. They were hateful and they were harmful, but I don't believe in guilt by association. . . . Ms. Muhammad has expressed in a very open way her commitment to continue to work on the mission of the hate crimes commission." Now, I'm fairly sure I wouldn't wish Fred Phelps anywhere near an anti-discrimination panel. Furthermore, I wouldn't trust any member of his "church" to represent him. Similarly, the Nation of Islam is notorious for anti-semitic and anti-gay remarks. This is absolutely indisputable. There is little justifying the presence of a commissioner who cannot make even a cursory repudiation of Farrakhan's bigoted statements. Why does Blagojevich continue to defend the Nation of Islam representative? Because this Democratic governor, facing an uncertain re-election battle against a socially moderate Republican this fall, fears one thing and one thing only in this controversy - his black constituency. Things have not improved since last week's eruption of the Illinois hate crimes commission. In fact, they've grown worse, with two more panelists resigning in protest against the anti-semitic and homophobic remarks given by Nation of Islam leader, Louis Farrakhan, at a recent gathering. Farrakhan's chief of staff, Brother Leonard Muhammad, said on the radio Tuesday that the Nation of Islam forgave the people who left the commission because "you left out of confusion. You misunderstand what the commission is all about. Come back to the commission and debate your point." He later issued a stronger challenge to them to return. "They need to come back or shut up," Leonard Muhammad said. "And leave me alone," Claudette Muhammad chimed in. For the second straight day, the Democratic governor refused to answer reporters' questions about the commission. He discussed other topics during an appearance in Effingham but shut the door of his SUV and drove off when asked about Muhammad's statement that Farrakhan's remarks were merely "perceived" as anti-Semitic. Sure, the governor could defend Jews and homosexuals when confronted with animosity from the Nation of Islam, but that would mean taking on Islam and an increasing community of defensive black politicians. Jews and mo's best learn their place in the victim pecking order. If you care to have a gander at some of these people as they've taken to the airwaves, here's a clip of a local news story from last night. The top story in Chicago today is the implosion of our state's hate panel. What happens when one minority really, really dislikes all the other minorities? At a packed United Center on Sunday, Farrakhan hit "Hollywood Jews" for "promoting lesbianism, homosexuality" and other "filth." He also said conservatives and Zionists manipulated President Bush into war. "Given the mission of the commission to look at discrimination and hatred, I think these two are demonstrating their hatred ... of others is too big to effectively do their jobs. It may be the best for the commission," Trotter said. Yes, intolerance of the Nation of Islam's intolerance is the real hatred here. Jessie Jackson and Al Sharpton incoming in 5 . . . 4 . . . 3 . . . They were being persecuted, while others wrestled over the minutiae of the Lutheran Church. The executor fit the nooses snugly around their necks. We found the intra-faith dynamics of lesbian ministers fascinating. And while the rest of the world shouted in protest, we remained thunderously silent. In the American culture wars, we wrestle over abortion, gay marriage, Tinky Winky, and whether or not God punished New Orleans for the excellent Southern Decadence festival. Safely ensconced in a society and nation firmly rooted in the values of the Enlightenment and individual freedom, too many of those who claim to speak for us have allowed themselves to wallow in their own pet, partisan causes as a growing darkness menaces the Western world. 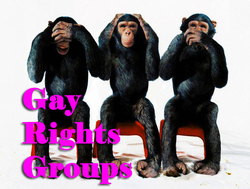 Many of us now find ourselves asking, "American GLBT Groups - Where are you?"